West Yellowstone MT)— Did you know that Yellowstone National Park and other government agencies behind the Interagency Bison Management Plan (IBMP) are planning to slaughter 900 buffalo this coming winter under the guise of “disease risk management” even though there has never been a documented case of a wild bison transmitting brucellosis—a bacterial disease that affects livestock and wildlife—to cattle? In an effort to avert the bloodshed, Friends of Animals (FoA) and the Buffalo Field Campaign filed an emergency rulemaking petition Sept. 15 with the National Park Service (NPS) and the U.S. Forest Service (USFS) to protect the genetic diversity and viability of the bison of Yellowstone National Park. They are requesting that the NPS and USFS undertake a population study and revise the IBMP to correct scientific deficiencies, make the plan consistent with the best available science, and follow the legal mandates the U.S. Congress has set. Until then, the groups are also requesting that the capture, removal or killing of bison at the Stephens Creek area of Yellowstone National Park and the Horse Butte area of the Gallatin National Forest be prohibited. Every winter and spring, snow and ice cover the bison’s food and hunger pushes them to lower elevations across the park boundary in Montana. When they cross this arbitrary line, the buffalo enter a zone of violent conflict with ranchers. 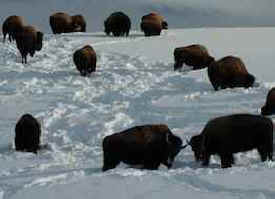 Last winter 653 bison were slaughtered, and back in the winter of 2007/2008, the largest scale wild buffalo slaughter, claimed the lives of 1,631 animals. At the turn of the 20th century, similar reckless behavior nearly drove bison to extinction. The IBMP was designed to be an adaptive management plan allowing for greater tolerance for bison as new information becomes available and conditions on the ground change, but no such tolerance has been afforded to the bison. 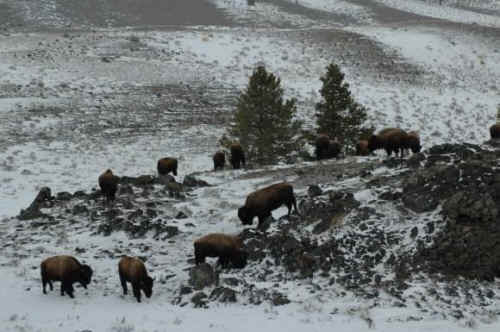 Despite new scientific research showing that the Yellowstone population is comprised of distinct herds with unique genetics and behaviors, the agencies continue to treat Yellowstone bison as though they comprise a single homogeneous herd, Brister said.